Back of a jewel box (taken in 1309 as a reliquary), one of the rarest examples of medieval Muslim art. The inscriptions, in "neski" characters, and the decorations, are realised with ivory incrustations on black background. Box in parallelepiped shape, ivory covered and painted in gold. It shows hunting scenes with the falcon. 17,5 x 48,3 x 19,5 cm. Antecedent to 1309, year of its first record. Box in trunk shape, plated with trapezoidal ebony and ivory sheets, alternated so as to create dichromate hexagons with three-dimensional effect. Box with geometric ivory, ebony and mastic inlays (concentric squares and octagons). Of parallelepiped shape, with cut-pyramidal cover, this typology is also present in Spain. Box in parallelepiped shape, with cut - pyramidal cover entirely ivory plated, with armours and locks in golden bronze. Assigned as a reliquary. Box in parallelepiped shape, entirely built in ivory, attributable to Sicilian-Muslim handcraft of the Norman period. Plated box of parallelepiped shape, ivory plated, with carved figures into panels, circled by a frame of rosettes gripped in carved rounds. 42 x 17 x 11 cm. Supposed from the 12th century. Walnut rectangular box, ivory plated, with phytomorphic patterned squares, sliding closure and handle. Probably Byzantine art. Wooden box, ivory plated, composed by staves decorated with concentric circles. Probably Byzantine handcrafted. Ivory pastoral crosier probably owned by St. Cataldo, bishop of Taranto. Information on this object is deduced from an inventory of the year 1309, (parchment of the Palatine Chapel). Decorated (probably in the 12th century) with fabricated jewels. It has been recovered and restored in 1981. Supposed from the 12th-13th centuries. Glass ampulla used, as indicated in the enclosed script, to contain "de pane Domini" (the bread of the Lord). Glass ampulla used as a reliquary to contain "De liquore capitis S. Caterine". This is what was indicated in an enclosed script. In the middle age, the devotion to St. Catherine was very popular. As well as the use to go on a pilgrimage to the great monastery on Mount Sinai, to purchase some relics of the body of the Saint that was lying there. Height 5.13 cm; Diameters 1.5 cm close to the edge and 3 cm max. Glass ampulla used as a reliquary to contain the blood of St. Demetrius from Sirmio, martyr of Salonika. Nowadays empty. Seal from the Mesopotamia datable from 2330 BC It reproduces a scene of Presentation (of probably the owner) to a god. Extremely rare and precious object, probably belonging to one of the Kings of the Sicilian-Norman dynasty, probably taken, or offered to the king, as part of a loot, after an expedition in the Holy Land, mistaken for and treasured as a holy relic. Cross-shaped reliquaries. The first on the left is constituted by two cross-shaped valves with hinges, that, when closed, give shape to the recipient of the wooden relic. One of the two parts of the second (made of wood) is missing. Metallic cross: arms, 3.5 cm ; longitudinal body 5,5 cm. Tabulary with parchments from' XI to XVIII Century. Parchment (first part) in Greek language, containing the chapters of the Confraternity of St. Mary the Naupattitissa. Book of the martyrdoms " Ecclesiae Make happy Palatii Urbis Panormi… ". The manuscript, to beyond the liturgic value, is conceived like a real medieval history book. Filler precise notations on the age normanna and that sveva, beyond that the died dates of of numerous monarchs, principles and ecclesiastics. Manuscript in parchment of the second half of sec. XII. 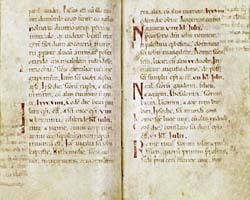 The Code, that it introduces the neumatica said musical notation, is from reconnecting to the liturgic use of the Chapel head Tippet, on the whole monumental the inserted Church of the Real Palace of Palermo, today Center of the Sicilian Regional Assembly and constitutes one of the principal sources for the study of the sicilian-normanna musical tradition. Seal affixed to a deed witnessing to the transfer of the royal tombs by Walter, archbishop of Palermo, during reconstruction of the cathedral, which began under him in 1185. The lead seal or "bull" shows on the obverse the Madonna and Child, to whom the cathedral is dedicated, and on the reverse a symbolic representation of the monument. The seal bears the Latin inscriptions: "Seal of St Mary's Church of Palermo" and "Church of Palermo". The document to which it is attached is one of the rare contemporary archives of the cathedral reconstruction and was issued by one of the most powerful personages of the court of William II (1166-1189), Archbishop Walter Ophamil. Holy water font in mosaic and carved marble, pertaining to the Palatine Chapel of the Palace of the Normans in Palermo. Shell shaped marble Holy Water font, with an embossed frame representing a soldier with a falcon. This figure could let us address the piece to the Swabian age. However, the habit to self-carry a falcon was very popular in the 12th century too.